The sun *is* the moon: An amalgam. My name is David Ulansey. 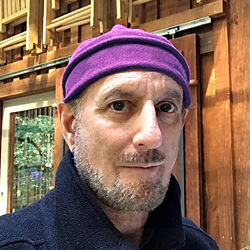 I am Professor Emeritus of Philosophy and Religion (Philosophy, Cosmology, and Consciousness Program) at the California Institute of Integral Studies in San Francisco. I am a scholar of the history of religions, comparative religion, and cultural history (Ph.D., Princeton Univ. ), and before teaching at CIIS I was on the faculties of the University of California at Berkeley, Boston University, Barnard College (Columbia University), the University of Vermont, Princeton University, and Pacifica Graduate Institute. My specialty is the religions of the ancient Mediterranean world, especially the ancient Mystery religions, Gnosticism, ancient cosmology, and early Christianity. I have also taught courses in a variety of more speculative areas such as the evolution of consciousness, archetypal psychology, alchemical symbolism, the metaphysics of cyberspace, and applied deep ecology, and I have been a frequent lecturer at the San Francisco C.G. Jung Institute. In addition to my work as scholar and teacher of the history of religions, I am also an environmental activist and filmmaker. I am the creator and webmaster of Massextinction.net, the web's foremost source of information on the current mass-extinction/biodiversity crisis (there is now a consenus among biologists that unless humanity changes its course, half of all species of life on Earth will be extinct in as little as 30 years). Massextinction.net was featured in Natural History magazine. In connection with my work on the extinction crisis, I am Chair of the Board of the Species Alliance-- a non-profit organization devoted to public education about the threatening mass extinction-- and I am the Executive Producer of the Species Alliance's new feature-length documentary film Call of Life: Facing the Mass Extinction. The film is now finished and has been screening in major festivals, where it has won a number of prestigious awards including the John Muir Award at the Yosemite Film Festival, the Award of Excellence and the Humanitarian Award in the Accolade Competition, and the Award for Best Science Communication Film at the Reel Earth Environmental Film Festival (New Zealand). A DVD edition of the film, with a license to host group screenings, is now available for order here! I am also the co-founder of the PlaNetwork project on information technology and the global environment. My publications have focused on the ancient mystery religion of Mithraism. For a summary of my book, The Origins of the Mithraic Mysteries: Cosmology and Salvation in the Ancient World (Oxford University Press, revised paperback 1991), click here. Those of you who have read my book in English may be interested in several important appendices that I wrote for a German translation of the book. To read these appendices in English, click here. For information on my forthcoming book, Mysteria: The Ancient Mysteries and the Evolution of Consciousness (based on a series of lectures I presented at the C.G. Jung Institute of San Francisco), click here. For my article The Mithraic Mysteries, published in Scientific American (December, 1989), click here. For my article Mithras and the Hypercosmic Sun click here. For my article The Eighth Gate: The Mithraic Lion-Headed Figure and the Platonic World-Soul click here. For an article of mine on cosmic symbolism in the Gospels (from the Journal of Biblical Literature) click here. For my article Cultural Transition and Spiritual Transformation: From Alexander the Great to Cyberspace, click here. For information on the Species Alliance to halt the mass extinction, of which I am the Founder, and the documentary film it is producing entitled "Call of Life" for which I am the Executive Producer, click here and here. Have you ever wondered how much each person would actually be entitled to if the world's resources were divided equally? For a ballpark estimate, see my article The Arithmetic of Compassion. For information about the Planetwork Project on the internet and ecological survival, which I co-founded, click here. For the fascinating story of the early history of the California Institute of Integral Studies, click here. For a collection of short poems of mine called "asterism" click here. For some of my music (two songs-- I'm on vocal and rhythm guitar), click here. Thanks for stopping by. To send me a message, email me at this address: david (at) mysterium (dot) com. and the earth may be habitable two billion more. and is able to follow a bright light with its eyes." Page designed and maintained since 1994 by David Ulansey.